Obama made clear he believes putting a Democrat in the White House this fall is the best way to sustain a justifiably sunny view of his stewardship, marked by economic salvation at home and a strong hand improving balky stability abroad. The point wasn’t to be discourteous to the GOP leaders who technically invited him to the Capitol to provide his final version of the State of the Union. 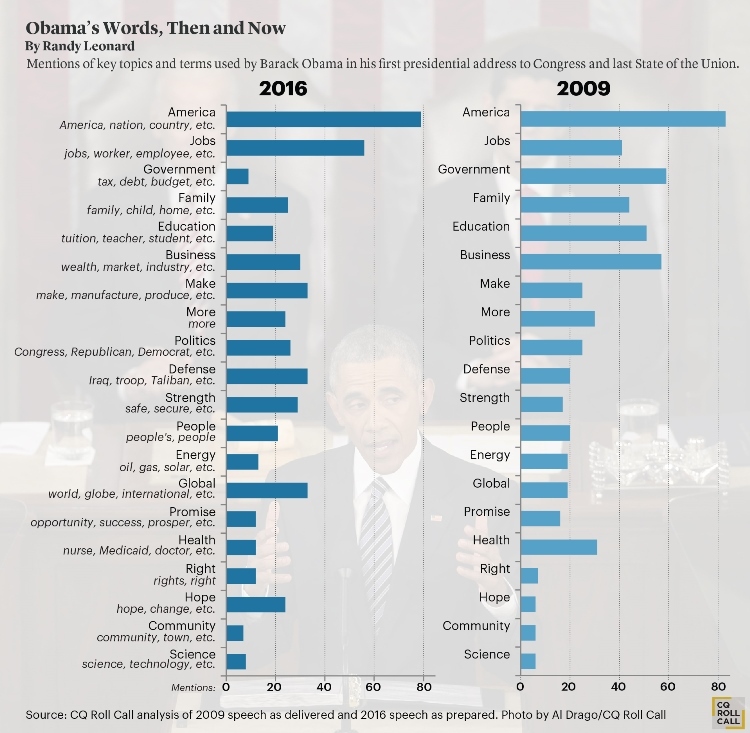 But from the start, Obama made clear he was less interested in winning over his in-person audience than ever before. Instead, he aimed his pitch almost entirely over the lawmakers’ heads and toward what could be the last national television audience he ever commands. Senators and House members were relegated by the rhetoric mainly to playing the foil, leaving many Republicans grumbling that for all his lofty talk about an optimistic future Obama was captive to his hectoring impulses until the end. “It’s not much of a stretch to say that some of the only people in America who are going to work the same job, in the same place, with a health and retirement package, for 30 years, are sitting in this chamber,” he jibed a few minutes after glad-handing his way onto the House floor. “The American people should know that with or without congressional action,” he said after a reiterating his so-far-ignored request for an Authorization for Use of Military Force against the Islamic State, he retains the power to continue his 16-month military campaign indefinitely. “It may take time, but we have long memories, and our reach has no limit,” he said. In a significant departure from the formula for modern State of the Union presentations, Obama made short shrift of his near-term desires and posed “four big questions” — along with detailed answers — about the broadest and biggest challenges he sees in a rapidly changing United States during the decade after he’s gone from the scene. What more should government do to provide an economic “fair shot” to the middle class? How can technological innovation best be harnessed next? How can America lead on the global stage without playing the role of the world’s policeman? Most pointedly, he asked, “How can we make our politics reflect what’s best in us, and not what’s worst?” — a defining assignment he took for himself when he ran for president eight years ago. Obama did not explicitly hold his robust assertions of executive power or his minimalist style of legislative courtship accountable. But neither did he name-check any of his most vituperative Republican critics, either in Congress during the past seven years or on the presidential trail now. Instead, he hoped for a future where bottomless buckets of unregulated money no longer fuel campaigns, redrawn congressional maps put more House seats within reach and turnout is boosted by modernized and easier voting systems. The president made a pointed appeal for congressional cooperation this year on only a handful of legislative matters — and none were the sort of bold new proposals that would have been destined for “dead on arrival” derisions from Republicans even if he weren’t a Democrat in the final year of his run. He even tacitly conceded he’d tried all he could by executive actions to tighten gun control. Instead, Obama volunteered to work with Congress to help reduce poverty and stem the wave of prescription opioid abuse that yields to heroin addiction — two areas on which GOP leaders, from the presidential candidates to Speaker Paul D. Ryan, have taken an interest. Otherwise, he reinforced his don’t-obstruct-me-now theme by focusing on measures already rattling around the Hill “in” box with once-solid but currently diminished potential for garnering broad bipartisan support. Topping his short list are approval of his trade liberalization deal with other nations on the Pacific Rim and completion of an overhaul of federal criminal sentences. He also pressed Congress to lift the economic embargo that still restrains newly normalized relations between the U.S. and Cuba. “I’m putting Joe in charge of Mission Control,” he said to loud applause — not least, presumably from Hillary Clinton, campaigning in Iowa but grateful her former potential rival now has plenty to keep his mind off what might have been. Fleeting Bipartisanship in State of the Union Snapchat See photos, follies, HOH Hits and Misses and more at Roll Call&apos;s new video site. NEW! Download the Roll Call app for the best coverage of people, politics and personalities of Capitol Hill.